Takashi Arai does not see daguerreotype as a nostalgic reproduction of a classical method; instead, he has made it his own personal medium, finding it a reliable device for storing memory that is far better for recording and transmitting interactions with his subjects than modern photography. 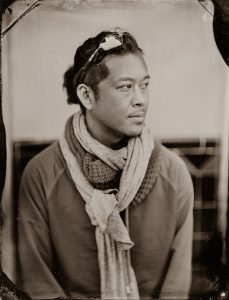 Beginning in 2010, when he first became interested in nuclear issues, Arai has used the daguerreotype technique to create individual records―micro-monuments―of his encounters with surviving crew members, and the salvaged hull, of the fallout-contaminated Daigo Fukuryūmaru fishing boat, records that touch upon the fragmented reality of events in the past. This project led him to photograph the deeply interconnected subjects of Fukushima, Hiroshima, and Nagasaki. Arai’s work has appeared in numerous exhibitions, at the Museum of Fine Arts, Boston, Mori Art Museum, the National Museum of Modern Art, Tokyo, among other international venues. In 2016, he received the 41st Kimura Ihei Award for his first monograph “MONUMENTS”(PGI, 2015). In 2018, Arai’s first short film “Oshira Kagami: The Mirror of the Oshira Deity” won the Category Prize at the 72nd Salerno International Film Festival, Italy. His works are held in the public collections of the San Francisco Museum of Modern Art, the Hirshhorn Museum and Sculpture Garden, the Museum of Fine Arts, Boston, the National Museum of Modern Art, Tokyo, and Musée Guimet, among others. Arai is a visiting researcher at National Museum of Ethnology since 2017.